Who are financing the production of Norwegian films? National film institutes in Europe cover 43 percent of total financing, while producers are responsible for 16 percent, regional funds twelve percent and distributors ten percent of the budget, on average. Subscription-based streaming services make up 0.1 percent of the financing. In order to make a new film become a reality, the producer is dependent on having enough financing in the form of equity, and often with production support from the NFI or other public authorities. A minimum guarantee (MG) from the distributor and advance sales of screening rights are other potential sources, in addition to several others. The composition of a film's sources of financing when the production starts, shows which stakeholders are willing to take the necessary risk for the film to become reality - at a critical point in the process. The following figures are based on a review of the financing plans for 20 films with a 2017 premiere in Norway, who all had received pre-production support from the NFI. The below figures give an overview of the most important financing sources for the 20 films. National film institutes in Europe cover 43 percent of the total financing, while producers are responsible for 16 percent, regional funds twelve percent and distributors ten percent of the budget, on average. Free-TV and public broadcasters contribute a bit more than three percent of the total financing and have taken part in the financing of about half of the films. Neither Pay-TV nor TVOD (film rental services) are involved in any project, while one single film received financial contributions from a SVOD (streaming service). As a share of the total financing, however, it is negligible (0.1 percent). Eurimages covers four percent, while co-producers, private investors and Nordic Film & TV fund covers about three percent each. The producers and distributors are still taking the highest risks in these projects, hoping for a theatrical release, to receive box office bonus and to sell the screening rights to other platforms. These platforms in particular – cinemas, pay-TV and various internet-based film services – do not in general contribute financially to a considerable degree. This is also the case in 2017. 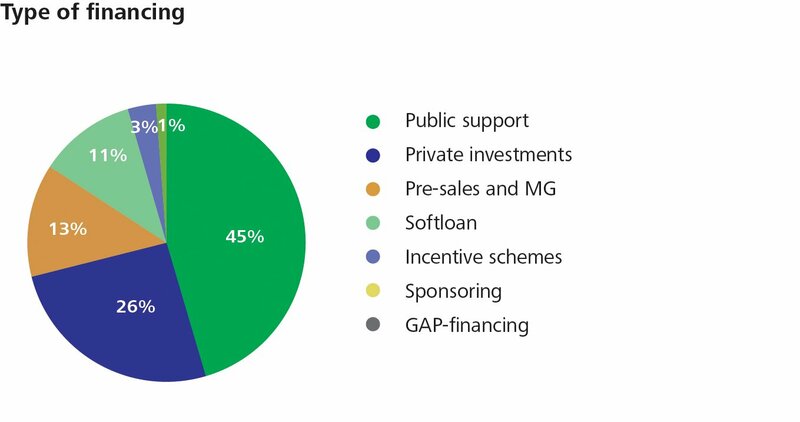 The below figure shows the composition of various types of financing at the start of production for the same 20 films: public funding contributes with the highest share of the financing with 45 percent, followed by private investments covering 26 percent. Pre-sales and minimum guarantee (MG) from distributors are responsible for 13 percent. Soft loans are loans granted primarily by public institutions on a local, regional, national or supranational level. The loans are meant to be paid back, but are granted with somewhat milder repayment requirements and on better terms than ordinary loans offered in the private market. In total, soft loans make up eleven percent of the financing of the premiere films. Finally, we notice the fact that the better part of these films' financing comes from Norway. 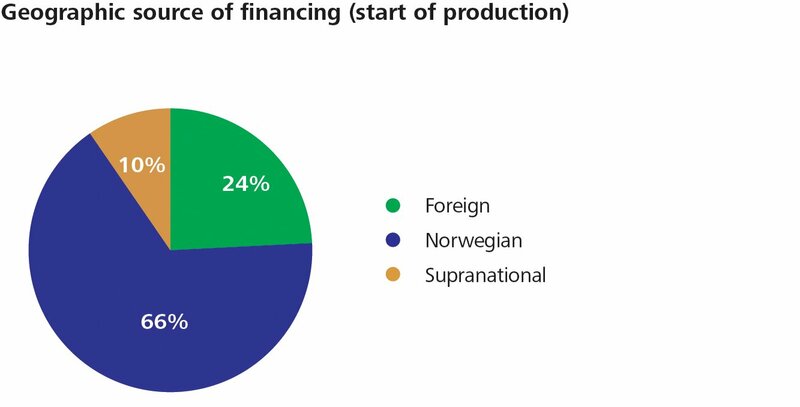 Norwegian financing covers 66 percent of the total at the start of production. Foreign financial sources also contribute with 24 percent. 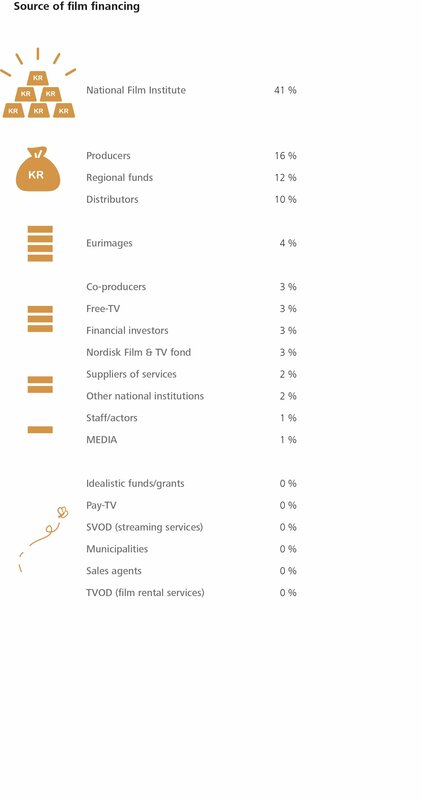 Supranational financing, like Eurimages, Nordic Film & TV fund and similar sources, are responsible for ten percent.